The USB-C bus-powered interface features a built-in DSP processor. Zoom has introduced its new GCE-3, a combined desktop multi-effects processor and interface. The USB-C bus-powered interface features a built-in DSP processor and includes a standard guitar input, aux stereo input jack and headphone output. However, all the unit’s panel controls are actually only there for aesthetic purposes; it’s actually controlled via Zoom’s Guitar Lab app for Mac/Windows. 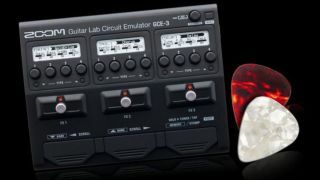 Given that the GCE-3 is a miniature version of Zoom's G3n though, the GCE-3 will likely feature a host of guitar and bass effects and amps/cabs. The availability date and price of the GCE-3 are not yet known. For more info, head on over to zoom.co.